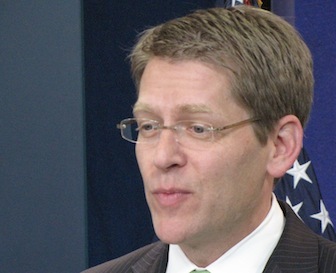 White House Press Secretary Jay Carney has apparently been pulled from the podium of the White House Briefing Room, as President Obama’s political advisers seek to control their messaging as much as possible and avoid unforced errors. Carney, the public face of the “openness” White House, has not briefed from the podium since October 10. It’s the only time he has appeared there this month. Obama’s travel does not explain Carney’s failure to brief. The press secretary generally submits to questioning before the cameras when the president is at the White House, and Obama has spent three days there in addition to October 10 – October 12, October 19, and today, when Carney is again not scheduled to brief. Carney continues to participate in off-camera “gaggles,” briefing reporters along with Obama campaign press secretary Jen Psaki during trips aboard Air Force One. But such briefings tend to be much shorter and less intense than the televised White House briefings, and of course cannot be scrutinized directly by the public. So the most open WH ever has stopped daily briefing…why is MSM not mentioning this? My thoughts, exactly. The most transparent administration EVER!!!! Too much hyperbole, too many superlatives, too much cover up. I don’t know how any of these people have a stomach lining left. They must have huge ulcers from all of the lying and evasiveness. It’s time to turn the lights out at the WH, change the locks, and and put the ’empty chair’ on the street for trash pick-up. Along with the empty podium!!!!! And the potato sacks. Mulch the magic garden (sorry Whole Foods). Dim-ocrats. Not one among them that has had a bright idea in four years. They’ve been running the country on the power of a night light, using solar energy as a back-up generator. This illustrates just how disorganized/dysfunctional this administration is and has been for the last 3 1/2 years. They can’t even manage their message. This will change 20 Jan 2013 when the professionals arrive. Not really surprised they are going into stealth mode now that information about Benghazi is starting to come out. Why isn’t anyone questioning where those emails came from that were leaked on Wednesday – the emails that prove the White House knew within two hours of the attack that it was caused by terrorists and not some vague video? They were leaked by someone in the White House, so the inner circle must be scrambling to find out who the mole is. Could it be the Carney barker? I doubt he even has a moral compass, but someone in the know is just as fearful of this fraud remaining in office as the rest of us are. Maybe they are afraid he will commit truth at some point–but that can’t be it. I got nothing on this. How Stalinesque. Will all future “gaggles” be in Russian? The lights actually went out in Denver at the first debate. Peggy Noonan has an interesting column today describing, among other things, how a U.S. Senator who served with Obama in the Senate and met with him in the WH said this is the real Obama – the guy we saw in Denver is who he really is. Also, interesting comments from Bob Woodward. With all of the negative feedback, why am I still waiting to exhale on Nov 6? Romney should be up by 20 points. It feels that like the devil incarnate is working overtime to steal this election by any means necessary. Girly, you’re not alone in waiting to exhale. Fresh air has been in very short supply the last four years and I am in dire need of some Romoxygen. I just sent another small check to the campaign. The reason you are nervous is the fear of a fixed election, fixed economic numbers, and some sort of October Surprise. Some people can see right thru people and others are fooled by them and the former can never understand why the latter can be so naive. I voted today for Romney, made sure the machine said Romney. I also voted to legalize pot in Colorado, just in case Obama wins. I could spend the next four years of Obama stoned and listening to old Pink Floyd, Alan Parsons, and Traffic albums. In fact, I suggest if Obama wins, all conservatives move to Colorado, not work, get stoned, and let the naive become wise. Fixed or “Sandy” the hurricane about to pounce on the east coast. If the electricity goes out for an extended period of time – more than a week – then what. I live in Pa. [read: no early voting]. Why, oh why, couldn’t that hurricane have held off another week? So what prevents the traveling reporters from asking the hard questions? Seems to me they’re afraid they’ll be kicked off the campaign. Once again the press is derelict in their duties. Wouldn’t put it past the campaign to kick them off in mid-air. Interesting….I had not noticed this!! If I was Carney I would have a problem standing up in front of the American people and lying!! Hmmm….interesting!! I had not noticed this! But, if I was Carney I would not stand in front of the American people and lie, lie, lie! !